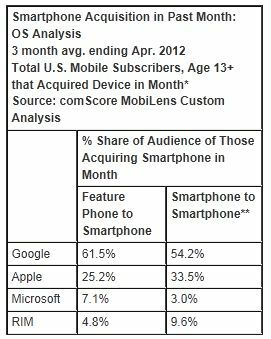 comScore, Inc. released results from a study of first-time U.S. smartphone owners with insights from the comScore MobiLens service. 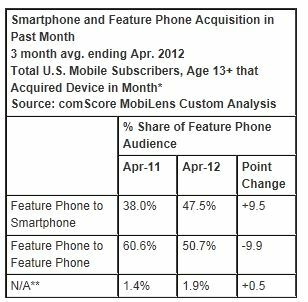 The study found that nearly half of feature phone subscribers who acquired a device during April 2012 switched to a smartphone, an increase of 9.5 percentage points from the previous year, as smartphone adoption continues its upward climb in the U.S. Among this audience, 61.5 percent of consumers acquired devices running the Google Android platform, with 25.2 percent choosing Apple devices and 7.1 percent opting for Microsoft smartphones.